The largest and most visited château in Loire Valley is the very grand Château de Chambord. Thomas and I made our way over to the massive property mid morning in hopes to beat the crowds and the heat. We were unsuccessful at both, but we seemed to find a few spots that were off the beaten path that gave us both an unobstructed view and a calming moment to take in the beauty. Château de Chambord is know for its elaborate French Renaissance architecture and with over 440 rooms, 280+ fireplaces and 77 staircases, it’s by far the largest château in Loire Valley. One could spend hours upon hours wandering the gardens and outside of the property without having time to even see the opulent inside of the château. This Maggy London dress is up there among my favorite dresses I’ve ever worn! The fit and the fabric are that of a dress that’s at least $300, but it’s currently on sale for $88. The overall look reminds me a bit of a Dolce & Gabbana dress I tried on in Florence and fell in love with, but at a much smaller price point. The full skirt swings beautifully and actually keeps you quite cool on a hot day. Can you spot me in the picture above? Thomas and I were obsessed with these spiral staircases before we even got to the property and knew we wanted to get this shot. Unfortunately, most of the staircase was closed, so we couldn’t go up all the way. I’ve been mixing my lace up gladiator sandals (last seen here) to dress down a lot of my feminine dresses that could easily look too formal if paired with the wrong accessories during the day. I’ve pulled a few other similar floral midi dresses here, here and here for more inspiration. Gorgeous dress and photos! Enjoy the rest of your holiday. omg this place is amazing and I love your dress! Wow, this place is amazing and I’m in awe of the architecture! And yeah, the dress you’re wearing is indeed gorgeous too, matches with the place just perfectly! Hey Julia! In my opinion, this post is one of the best ones you’ve ever posted. It’s like the pictures were taken straight out of a fairytale. I also love how you tend to dress down formal summer dresses with more casual shoes. I also like dressing classy/preppy pieces with more cool pieces to keep a good balance! The castle looks really dreamy and beautiful. I love all the details it has. Your outfit is very cute as well and the combination with these sandals is a good idea! Every post of your is as stunning as the last. Beautiful! Wonderful and so romantic! The sandals suit perfect to the floral dress! 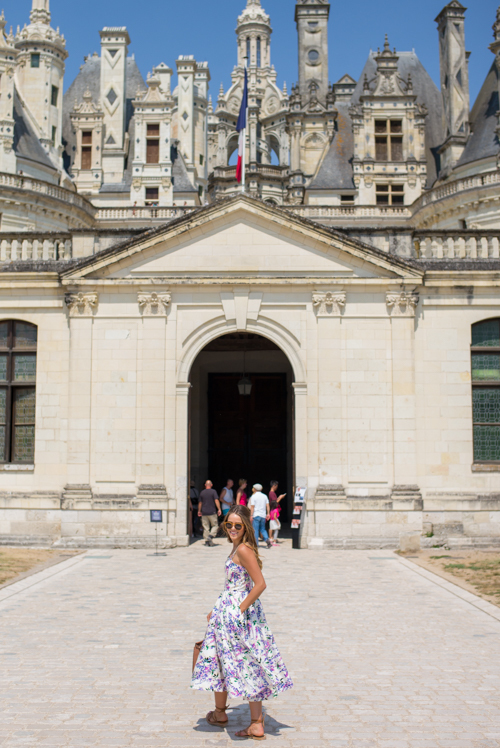 Chambord is a magical place, your dress is amazing! Wow this dress is gorgeous! I can’t believe it is only $88. I love the print and the beautiful colors on it. Also love how you dressed it down! I always write “i love your pics” or “your photos are dreamlike”! But what else can I say? Lovely outfit. the dress is as always perfect! This outfit is beautiful,I am more than in love with this dress! The place is incredible! The Loire Valley has been on my bucket list for a while. I love the dress, Julia! 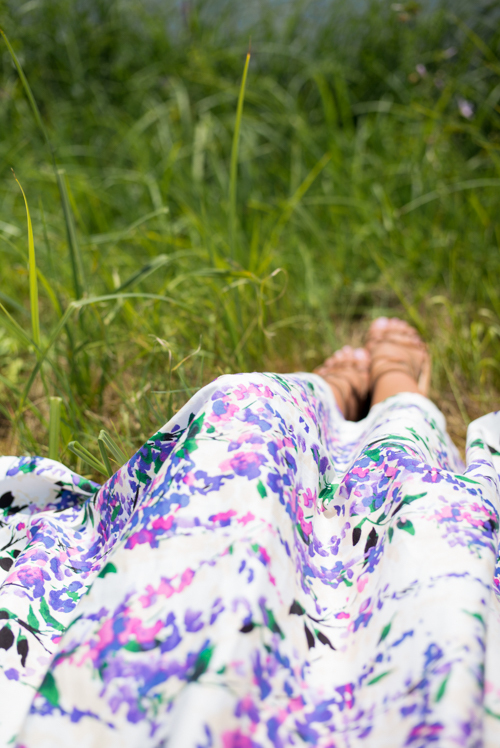 Nothing like a flower print dress to beat the summer heat in style! In love with this dress! Perfect! Beautiful dress! I love the print. At first I though you were wearing a Dolce&Gabanna dress! What a great find! And this castle looks beyond picturesque, wow! love how you catch the scenes, thomas is doing a really amazing job! Beautiful photos and really pretty dress. You got some really great shots with the castle! The dress is so affordable, love it! The dress and your backdrop are just dreamy!!! Stunning shots, Julia! This is one of our favorite dresses that we’ve seen on you! Love it! Wow! Château de Chambord is absolutely gorgeous!! And your dress is gorgeous! Wow that dress is amazing! It looks amazing on you, and your hair looks so cute. I am loving every single one of your photos from Paris. Everything is beautiful and of course you are nailing your outfits! These shots are so gorgeous, what an absolutely beautiful place, it looks like a fairytale! And your dress is so pretty! I love how you dressed it down with a pair of casual sandals, that is an excellent way to balance out a more dressy dress! obsessed with your dress and this castle! both so gorgeous! Again, a beautiful post! Love, love that dress!!!! I am in love with this dress, Julia! The colours are gorgeous. Also loving the Château de Chambord photographs, it looks so magical there. You look like a princess in front of her castle! you look amazing! and that chateau is incredible! Love this dress!! So cute!! Great pics!! Beautiful place and outfit ! Cute dress! And gorgeous photos! Wow that chateau is amazing! Perfect dress for the location. I love the pattern on it! And the midi length looks and works great on you! Love the post girl! This dress reminds me of the lilac tree that was at my house growing up. Such a sweet cut too. And of course the backdrop is gorgeous ? Breathtakingly beautiful! I will definitely visit the place! This is so pretty! So jealous of your travels. Hope you had a wonderful time! Everything about this post is incredible. Definitely one of my favorites so far. This dress couldn’t be more perfect with the scenery! You give me so much wanderlust! Beautiful pictures and beautiful dress! As always, beautiful images! Thanks for sharing your travels. Can’t get enough of Chambord… love this! In love with this floral dress it looks perfect for France! This dress is beautiful! What a perfect dress to wear while visiting this place! Gorgeous! That dress is stunning! I love it and I love that it has pockets! wow that is gorgeous! such a perfect backdrop. those sandals look cute and comfy for exploring! This chateau is such a dream!! And you got such beautiful photos of both you and the chateau. What a perfect day. This chateau is overwhelmingly beautiful! Love the first picture and that dress is gorgeous. STUNNING dress with even more beautiful backdrop. I truly look forward to your posts- makes me feel like I am there! Love you snapchat stories as well! OMG.. that dress is GORGEOUS!! :) Love it!! You look so graceful, Julia! Also, the architecture is awe-inspiring. Unbelievably gorgeous photos, as per usual. So stunning. Another gorgeous outfit on your trip! Love it! These photos are absolutely gorgeous!! I LOVE your dress! I love those lace up sandals with that romantic dress! Such beautiful scenery and colors! STUNNING. Everything about this look is gorgeous! The print on that dress is lovely and I like the length. Such a lovely print! You look beautiful! This location and dress are both stunning! And I love the picture of you on the staircase! Looks like such a magical place. Wow so a magical place!! I want to go there too!! these pictures are just stunning and i would have thought that dress would be so much more expensive. what a great buy. So stunning as always! Looks like you’re having so much fun just by these photos :) I love your gladiator sandals! This dress is so gorgeous! I love that floral print! lovely dress and lovely pictures! Love how you toned the dress down with the gladiators, it opens up so many more options for a fancy frock! Your dress is stunning! I love long floral dresses.Gorgeous photos! So beautiful! I love that dress – so feminine & it has so much movement! I adore that dress! So beautiful!! These photos are stunning, I’d love to visit here someday. Gorgeous outfit by the way! Lovely as always. You look like you belong right where you are, by that chateau. Gorgeous and feminine outfit. I love this all so much! What a beautiful place and a beautiful outfit! Beautiful outfit for a beautiful day out! These pictures are absolutely stunning! I love your dress – the fit and colors are gorgeous! I can totally see why you love this dress! And that’s a really smart approach of dressing them down with the right footwear! Hi Julia, I’m in love with your dress and the shoes you paired it with. You look simply fabulous! The backdrop is beautiful, I love old castles! It really looks impressing. This is stunning and the backdrop really picks up the floral pattern of your dress! Great look girlie. Your travels are seriously inspiring! Hope to visit just a fraction of the places you have already with your hubby! Such a lovely dress, you look amazing! This chateau looks incredible! 77 staircases and 440 rooms? Now that’s pretty extravagant. I’m loving that $88 price point for that dress – great deal! So pretty, Julia! I love all of the scenery in your posts, truly amazing! Stunning as always! The location and the look fit in each other so well! This dress is perfect for this location! Loooove this feminine dress! It’s perfect. The architecture of the château is amazing! Plus that dress looks perfect for a steamy day in France! Your outfit couldn’t have been a more appropriate choice for the surroundings. You look fantastic as always, and I love that you tried to get those shots up in the staircases. Perfect photo-ops right there. The soft floral bloom prints of the dress are so lovely and the silhouette is absolutely feminine and gorgeous! Amazing building too, the architecture is breath-taking! Thanks for sharing! This dress is gorgeous! I love the colours and the background is breathtaking! Beautiful scenery and beautiful outfit! Love this look! It really is a perfect dress for summer. All your travels look amazing, by the way. The settings make the perfect background for such pretty outfits! Beautiful dress, feminine and gorgeous on you as usual! I love the dressed-down look with the neutral gladiator sandals and fendi bag of the same tone. Glad you found these spots – the photographs look amazing. Absolutely breathtaking photos as always.. That chateau has now become one of my must visit bucket list!!! These photos are absolutely stunning and so are you ! Actually, while we’re talking about stunning that dress is definitely as well haha. Just an overall stunning post. So in love with all of these photos, this place looks amazing ! That dress is stunning! All of these photos look like something off of a movie set, the surroundings are just surreal. That spiral staircase is stunning and as always, Thomas did an amazing job! I love the entire outfit, especially the mini skirt. Where can I buy that mini skirt or something similar? Lovely as usual. I always admire your beauty. Looking gorgeous in the floral outfit! Love your new blog post layout & how the text is more like captions to the photos. It’s like having a storybook unfold with your amazing photographs. Gorgeous post!! What a beautiful dress. It’s now sold out but if anyone can help me find it anywhere I’d appreciate it!!! !